I must admit that I struggled getting out of bed this morning. But – I had a very good reason to get up! 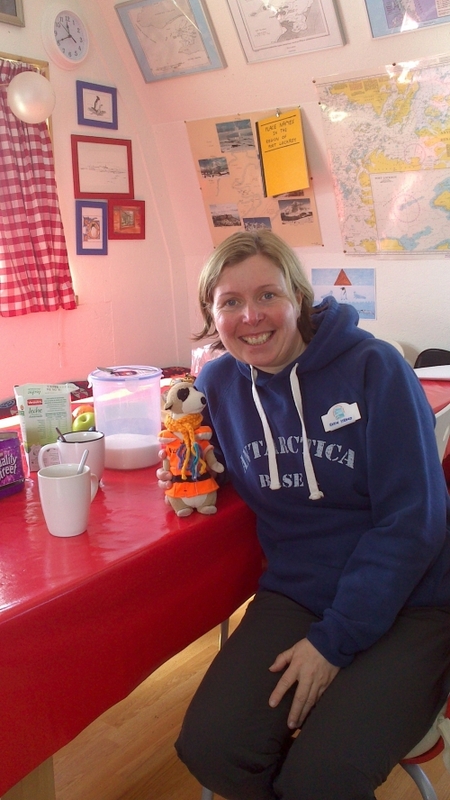 We were back at Port Lockroy which meant that I would see my new friend Karin again. Karin joined us in Ushuaia on the 09th of January. We gave her a lift to Port Lockroy, where we dropped her off two days ago. 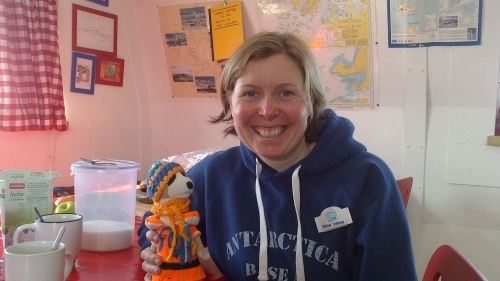 Karin usually works as Expedition Leader on board the “Fram”. This season she got an invitation to join the team at Port Lockroy for two weeks. I was excited to see Karin again! Once Esther was done with all the passport stamping and postcard matters we hopped into a Zodiac and went ashore. I was a bit disappointed at first, because no matter how hard I looked – I could not find Karin. We asked around, but nobody had seen her in a while. Stephen, one of the people working at Port Lockroy, later looked for us and wondered if we had found Karin. Since we had not seen her he went to take a look – and came back with a big smile on his face. We were invited to the private accommodation of the Port Lockroy personnel – the rebuild Nissen hut!!! It was so nice to see Karin! She offered us a cup of tea and biscuits and showed us around the building. The original building, which served as a storage place in the old days, had collapsed while the station was not in use. It was rebuild in 2010 and now serves as accommodation. Nissen Hut is actually off-limits to visitors. Hihi – guess I’m special!